QUILTING WITH AREA 3: Great Idea! You know, believe it or not, not everything is about quilting (yes, I know, the drugs are wearing off!). Take one of those noodles you can get at the dollar store, tie with rope to fit around a plastic bin. 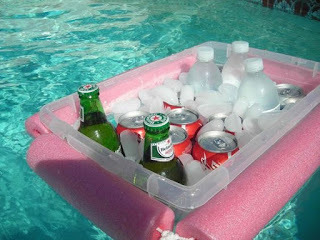 Add ice and drinks and throw in the pool or lake. Add a rope to tie it to the wharf/tree it if you use the lake so you won't have to retrieve it.